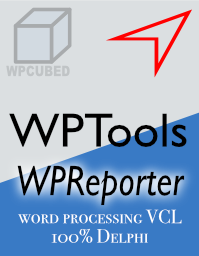 WPReporter is an add-on for the WPTools VCL. It is included in the “WPTools Bundle”, “WPTools Premium” and can also be purchased seperately if you already bought WPTools. (Also included in the Bundle and Premium edition is since WPTools 8 the component TWPTextProducer. It is a unique and powerful tool to create and update tables within a document in the WPTools editor component). WPReporter also includes a tool to create documents from a template and data (RTF reporting) and to add calculation to text and tables. It can be described as a extended implementation of mail-merge. Instead of just having fields in the template, it also allows to use groups (for conditional merging and master-client relations ships) and bands, to create header and footer. 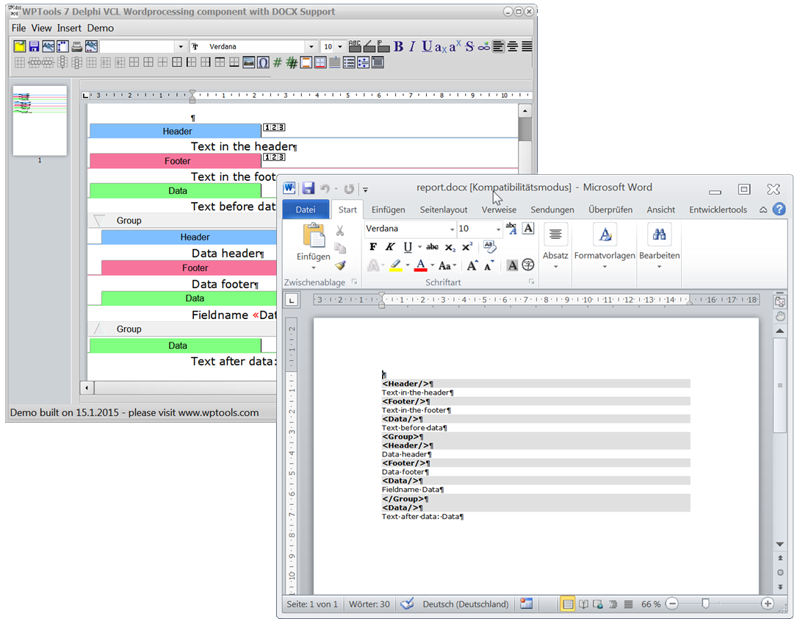 The templates can be created and edited in the regular editor. Bands and groups will be displayed graphically. It is also possible to have tokens in the text to be converted by a dedicated function to be used as template. The token to template conversion uses special character combinations to separate the commands from the text. Fields have to be embedded into the characters << and >>. The name of a field may contain space characters. Using such fields mail merge documents can be created. Such merge documents only require fields to be filled with data. Using mail merge does not require the reporting extension so we decided to make the syntax highlighting and token to template conversion available in the basis edition. Bands are identified by a colon (‘:‘) after the opening << characters. HEADER_OFF = this header is disabled. FOOTER_OFF = this footer is disabled. Bands must be the first non white space (white space= space or tab characters) in a paragraph. All text after the band token will be ignored and can be used to write comments. Groups are identified by a double cross (‘#’) after the opening << characters. While bands <<:…/>> are not nested, groups can be nested and so are embedded into a tag pairs <<#…>> <<#/….>. Unlike header and footer bands the name of the group tags are not fixed. Practically any name can be used if it does not contain spaces. However the opening token must match the closing token. For practical reasons the names should match the database which is referenced inside of the group. Note: The name of a group will be passed to the event OnReportState while creating a report. This event has to decide if a group should be processed (again) or not. It can create a sql query and calculate sub totals.